NR3922 9669. 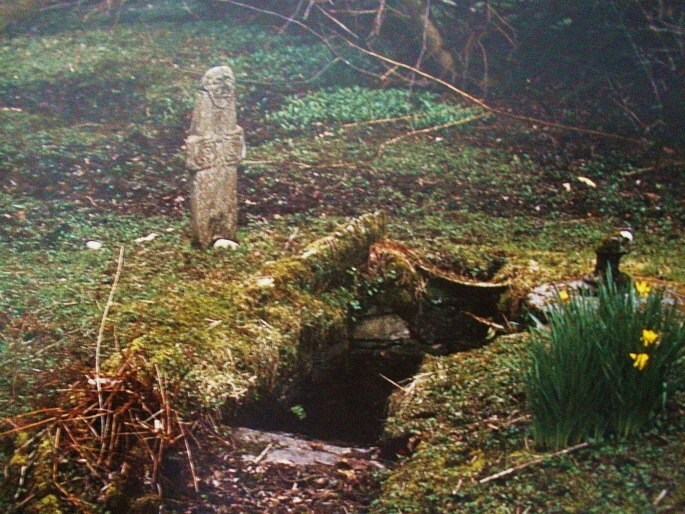 Near the north-western coast of Colonsay Island in the Western Highlands, in some pretty gardens belonging to Colonsay House, is the holy well of St Oran, known also as Tobar Oran. The well is on private land. Apparently the Irish saint, Oran or Odhran, who was the brother of St Columba and a follower of that great saint had a cell here at some point in the mid 6th century AD. He died on the Island of Iona where a chapel is still dedicated to him. Today the well is little more than a rectangular-shaped hole in the ground with some foundation stones around the edges, but it still has water flowing into it which, long ago, was regarded as miraculous with pilgrims coming here for curative purposes. And even today the well of Tobar Oran is still visited by pilgrims from far and wide. Close by the well is a curious-shaped little cross that may date from the 7th-8th century AD. It measures 17 inches (0.37 metres) in height by 13 inches (0.33 metres) across and is made out of local quarried stone with various carvings including what could be the face of Christ at the top; the bottom of the stone tapers away forming the shape of a fishe’s tale. The cross has very small arms three-quarters of the way up with spiral patterns. This type of decoration is quite prevalent in Ireland – so could this little stone have been carved by St Oran himself in the true Irish tradition. Originally the stone stood at the nearby ancient Chapel of Ruisg Buidhe but it was moved to its present site in recent times – this is why the little cross is often called ‘The Ruisg Stone’ or sometimes ‘The Buidhe Stone’. The ancient chapel at Ruisg Buidhe perhaps taking its name from another saint from Ireland, St Buithe? Categories: Holy Wells, St Columba, St Oran's Well, Tobar Oran | Tags: St Oran's Well at Colonsay In the Western Highlands | Permalink.